If you are wondering why you haven’t heard anything lately from the PSERN Project, it’s because the PSERN staff have been working hard on the many Project activities. There are several moving parts on a Project of this magnitude and times we need all hands on deck for various tasks so that has taken from our ability to produce the newsletter. Two very significant events have occurred over the last 3 weeks. After just over 26 months of work we have finished the final design of the radio system with Motorola. Our technical committee (comprised of system managers and technicians maintaining the current radio system) has worked tirelessly to review all the documents that comprise the final design. An iterative design process was used while working with our technical consultant, technical committee and Motorola, and of course Project staff. With the completion of the final system design, I am happy to announce that we are now in Phase 4 of the PSERN Project, which is the “implementation” phase (there are 5 total phases). 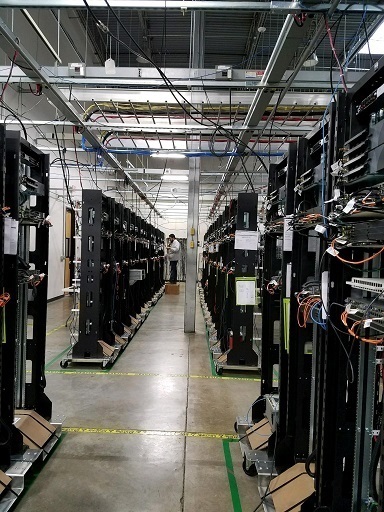 This is the phase in the Project where we will complete factory acceptance tests, ship and install the new radio and networking equipment, perform system testing, train end users, deploy end user radios, and perform coverage testing. 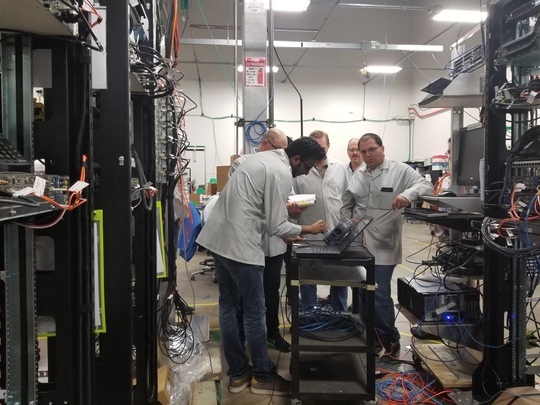 Also last month, we reached a major milestone when members of the PSERN team and technical committee traveled to Austin, Texas to perform the Backhaul Factory Acceptance Test (BFAT) on the Aviat Networks Inc. factory floor. This is a huge Project milestone for us because it marks the movement from the design phase to the implementation phase. We have also ramped up outreach efforts to users of the radio system so you will be hearing more about happenings on the Project. PSERN staff are meeting with various groups, talking about new system improvements, equipment features and functions, training and testing. There are more than 16,000 users that we need to reach so we need your help spreading the word. I would also like to be sure to take time to acknowledge the hard work of my staff over the last three and a half years. This Project is very complicated for many reasons. But fortunately for all of us, my staff are dedicated professionals who are committed to building a network that meets the needs of public safety throughout the region. I am 100% confident that the results of our work will improve the emergency communications capabilities for first responders and thereby improve services for radio users and King County residents and visitors. My staff have my unfettered appreciation for the hard work they do every day. Please be sure to forward this newsletter to your colleagues in your offices and departments. We have provided contact information at the bottom of this newsletter so you can let us know if you would like us to come and talk to your organization or provide us with any feedback. 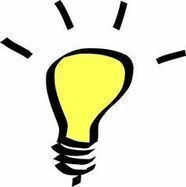 Also please visit our Web site and Twitter page to keep up with more timely information about the Project. As the Emergency Radio Communications Director mentioned above, BFAT testing took place last month and was a huge milestone for the Project. 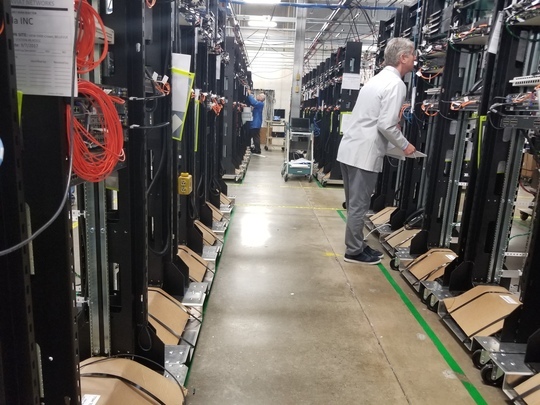 Aviat Networks Inc. reps gave the PSERN team and partners a huge compliment saying that they have never worked with a more focused, thorough and professional team. What's next? The microwave equipment will be thoroughly tested once more in the field. PSERN Mascot Sparky went on the trip to Texas as well. Click here to read his blog about it! PSERN Team and partners in action testing equipment. 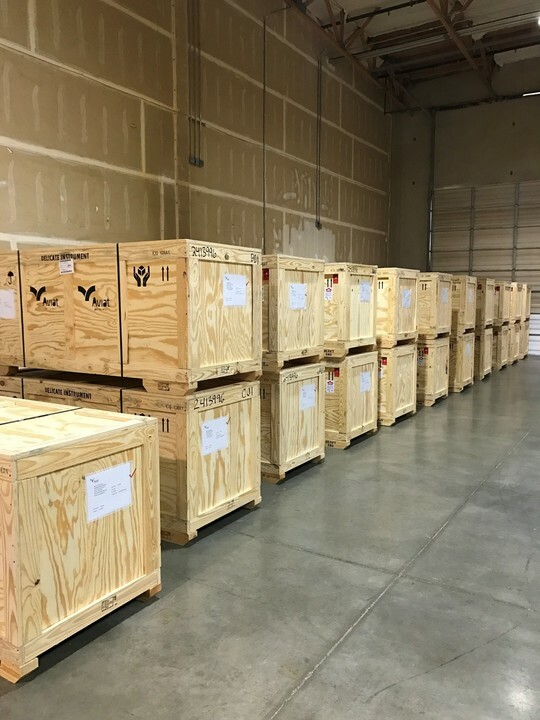 Loads of BFAT equipment waiting for field testing. You may think that because we are now in the fall months that construction work has to stop. Actually, radio sites that are located in what we call the "low lands" will still have construction going on throughout the winter months. However, the mountain sites are more prone to be impacted by snow and icy conditions which make it challenging for construction to take place. Currently we have a total of 9 radio sites complete. 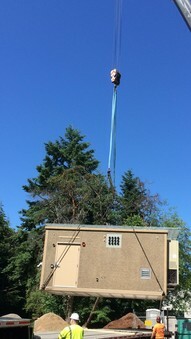 Picture: New shelter delivered to the Criminal Justice Training Center radio site. 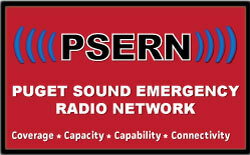 The PSERN Joint Board governs the Project and is made up of members from various partners—King County, Valley Communications (ValleyCom), Eastside Public Safety Communications Agency (EPSCA) and City of Seattle. Any major Project decisions must be presented to the PSERN Joint Board for approval. 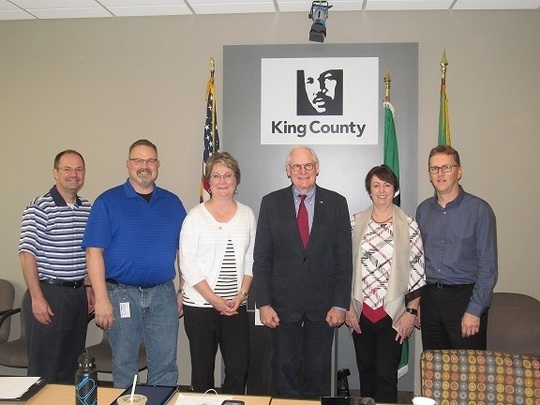 From left to right: Kurt Triplett, EPSCA , Chris Elwell, King County Fire District #2 Fire Commissioner, Lora Ueland, ValleyComm Executive Director, Fred Jarrett, (Chair) King County Deputy Executive, Shron Potts, Director, Enterprise Business Services and Mark Schmidt, (Alternate) City of Seattle. Not pictured: Chief Harold Scoggins, Seattle Fire and Chief John Vinson, University of Washington Police. The PSERN Joint Board operates in a unanimous voting structure with four voting members and two non voting members who are representatives from Police and Fire. 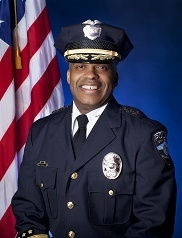 Assistant Vice-President For Student Life/Chief of Police John Vinson has led the CALEA Accredited University of Washington Police Department (UWPD) as Chief of Police since February 2009. The UWPD provides comprehensive public safety and police services to a campus daytime population of 72,000. Under Chief Vinson’s leadership, the UWPD has developed and implemented strategic initiatives in community policing, organizational efficiency and proactive policing strategies. With over 23 years of law enforcement experience, Chief Vinson holds a Ph.D. in Public Administration from Western Michigan University and is a graduate of the FBI National Academy. Along with his extensive varied law enforcement experiences, Dr. Vinson is an adjunct faculty member teaching leadership and management courses in the Master’s of Public Administration Program for Central Michigan University. He is also currently an adjunct faculty at Seattle University, and has instructed courses at Western Michigan University, Kirtland Community College and Montcalm Community College. 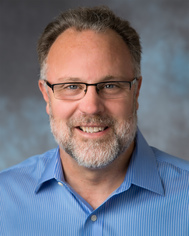 As a member of Seattle University adjunct faculty, Dr. Vinson was one of the co-investigators on a research project titled “Evaluation of the Washington State Criminal Justice Training Commission’s “Warriors to Guardians” Cultural Shift and Crisis Intervention Team (CIT) Training. He and other members of the research team presented their initial findings at the International Academy of Law and Mental Health Conference in Vienna, Austria in July 2015 and additional findings in Prague, Czech Republic, July 2017. The PSERN Joint Board welcomes Chief Scoggins as the new City of Seattle representative! Chief Scoggins has more than 30 years of experience in the fire service. 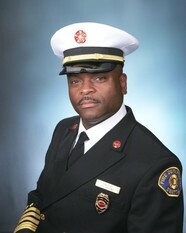 He started his firefighting career as a member of the United States Air Force where he served as a firefighter. In 1989, Chief Scoggins joined the Glendale Fire Department where he advanced through the ranks serving as Firefighter, Engineer, Captain, and Battalion Chief and in 2008 being named as Fire Chief. In April 2015, Chief Scoggins became the Chief of the Seattle Fire Department. Chief Scoggins oversees a workforce of more than 1,000 uniform and civilian members who respond to more than 97,000 responses a year while serving a population of approximately 700,000 residents. Under Chief Scoggins, the department is organized into four divisions: Administration, Fire Prevention, Operations and Resource Management. Meet PSERN's new Contracts Manager Marta Tarabella-Marchesi! Project! 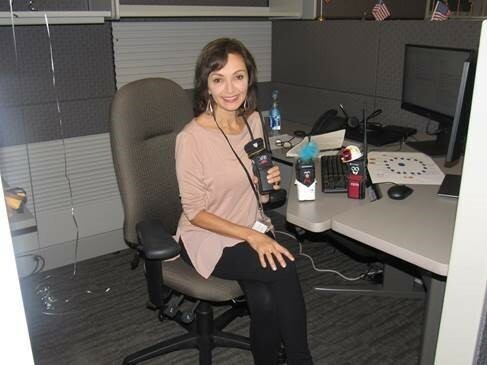 Marta recently came from Boeing where she was a Procurement Manager responsible for procurement process at a multi-billion dollar level and later moved into a Contracts Manager role she was mainly responsible for pre and post award procurement functions. The PSERN team is excited to have her on board! The PSERN team has been conducting outreach meetings with various users to talk about the new system! If you would like us to visit your organization please contact Karla Clark, Communications Manager at karla.clark@kingcounty.gov to set up a meeting. The new PSERN tower at Norway Hill was constructed using 1,493 bolts!